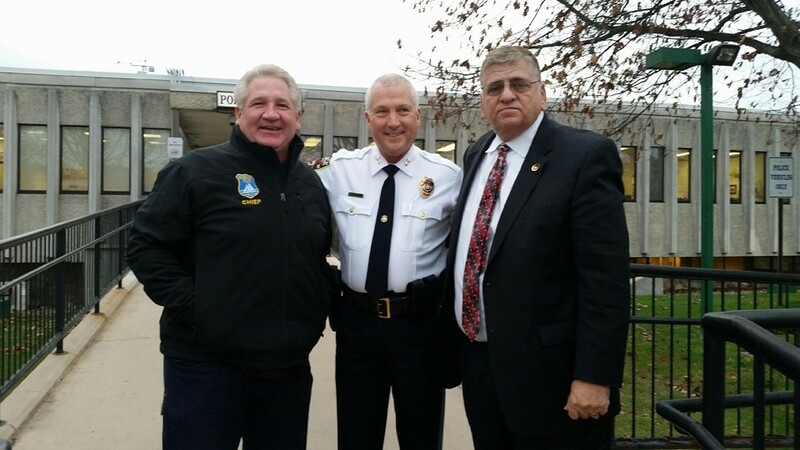 Chief Nils R. Bergquist, in front of the Brick Police HQ Monday, along with Seaside Heights Chief Thomas Boys (left) and Sheriff Michael Mastronardy (right). Monday was Brick Police Chief Nils R. Bergquist’s last day on the job after 39 years in law enforcement and 35 years in Brick. He was joined on his way out of Brick Police headquarters by Ocean County Sheriff Michael Mastronardy and Seaside Heights Police Chief Thomas Boyd. Bergquist, who served as an officer in Seaside Heights and Ocean Gate before coming home to Brick, said he plans on remaining in town and being involved in local organizations. Here at Shorebeat, we thank the chief for his service, and his dedication to the Brick community. When I began the original Brick Patch site back in 2010, the chief was the first person I interviewed (a referendum that centered on police funding had recently been defeated), and the first township official I met. Despite living in Brick most of my life, I had never covered the town professionally and had not had the opportunity to interact with local officials here. Far too often, the relationship between the media and law enforcement is adversarial. But here in Brick, that has been the furthest thing from the truth. The door to the chief’s office has always been open, and he’s always been a phone call away. During Superstorm Sandy and others times of weather (and other) troubles, the chief’s dedication to help keep our community informed was second to none in Ocean County. Having covered numerous communities, it is not often one sees a town that has as positive a relationship with its police department as Brick. That is the product of leadership that sets a tone of professionalism, friendliness and community-mindedness, and hires officers who similarly hold the same values. Chief Bergquist has left a stellar legacy behind with the Brick department, and we wish him a happy and healthy retirement.